Weekly update: 17 races run, and 49% of the way to $52,000! We’ve now raised $25,584 for the GBS/CIDP Foundation. And I’ve run 17 of the 52 races I’m running this year to raise awareness for GBS! Weekly stats: 49% of the way to the $52k goal, and 33% of the way to the running goal. It was another great week in FiftyTwoFives fundraising! Qi Lu headed on over to IndieGoGo and donated a generous $250 to the cause. I also had a very generous $200 donation this week from Martin Hosking. It’s very cool that they’ve joined the nearly 100 people and organizations that have got behind this fundraiser. Thank you to them, and thank you to all of you! 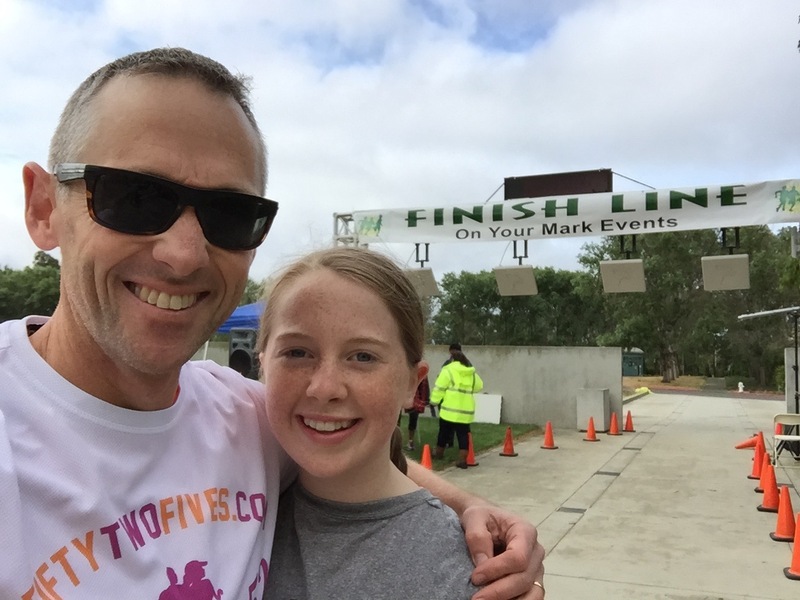 I ran two races this week, and the race reports are posted here at http://fiftytwofives.com. In a Steve Bradbury style twist, I actually *won* a race — yes, that’s right, I’m the proud owner of a crystal trophy and a $25 gift certificate. You’ll have to read the report to learn more! 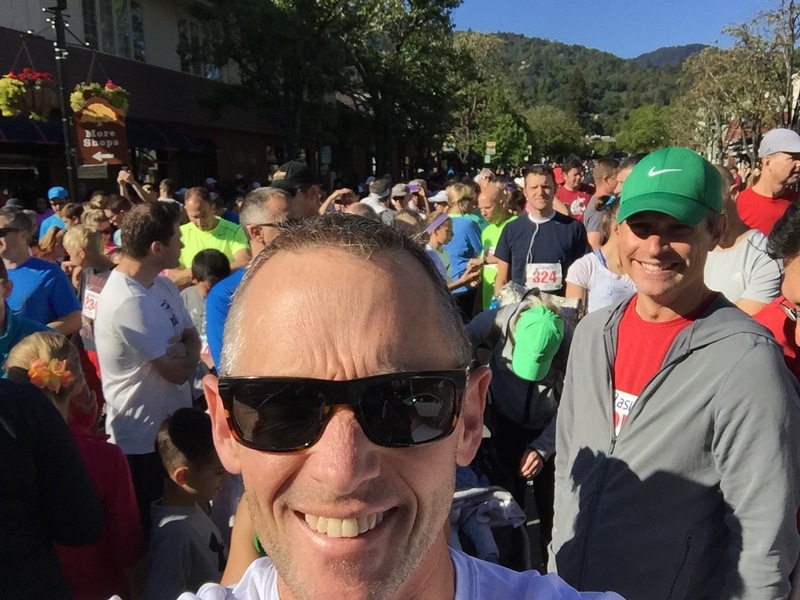 The Great Race from Saratoga to Los Gatos is aptly titled! And it was the site of Race #17 in 2015 in my journey to race 52 times to raise $52,000 for the GBS/CIDP Foundation. If you’d like to be part of helping me raise awareness for Guillane-Barre Syndrome, then donating is the best thing you can do. Lined up at the start of the Great Race in Saratoga. The guy behind me posed nicely for the photo too! Today’s race was the 38th running of the Great Race. I’ve raced this race four times in a row, dating back to the 2012 edition. 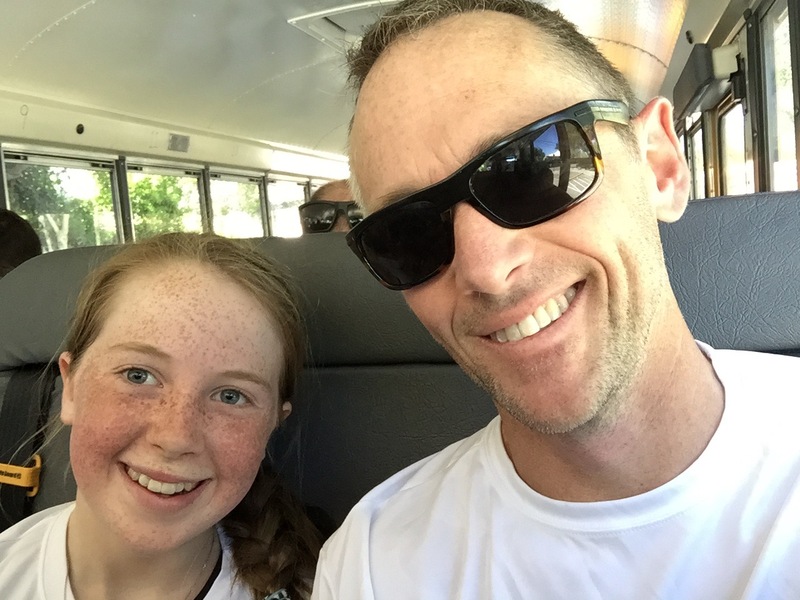 Every year, it’s been the whole family, with the exception of this race — Selina’s away with Rose, and so it was Lucy and I who carried the torch. It’s a terrific, I mean great, race. The start is in beautiful, sleepy downtown Saratoga, CA on Big Basin Way. Around 1,000 people lined up tightly, with a large contingent of families running together and typically closer to the back. After a quarter mile or so, it’s a hard right onto Highway 9, and three miles or so of running until you reach downtown Los Gatos. Then, it’s a hard right onto North Santa Cruz avenue, and maybe a little over a quarter mile to the finish line. The first little-more-than-half is deceptive. It looks flat when you’re in the car, but it’s actually a very gentle climb until the three mile mark (with the exception of a half mile dip in the middle). It takes more out of you than you’d expect, and if you’re accustomed to running 5k, then the 4 mile or 6.5 kilometers comes as a shock. I’ve never run the race at anything above a jog with the kids. Today, with Lucy off with her friends, I thought I’d give it a shot. I’m not sure that was the wisest move after yesterday’s race, but I’m not the wisest at the best of times. Anyway, I came 71st out of a thousand or so, but a disappointing 21st in my age group of 40 to 49. There’s some fast middle age guys out there for sure. I was happy with a time under 29 minutes, and winner won it in a completely-bonkers 20 minutes. Insane. He beat the guy who came second by nearly two minutes. Wow. After the race, there’s a nice festival, cool t-shirts, and a nice display of the 38 different t-shirts from the event over the years. If you’re reading this Los Gatos Rotary club, then I’d like a retro look like the 1985 edition next year please! Then, it’s time to jump on a school bus and take a ride back to the race start (where the car’s parked). Alright, it’s time for a few days off from running. I’ll share news of an adventure that’s coming up soon! Promise! Race 16 of 52 was on Saturday April 25. That took me 31% of the way to my goal of running 52 races in 2015 to raise awareness of Guillane-Barre Syndrome. Most importantly, I’m also focused on raising $52,000 for the GBS/CIDP Foundation. If you’d like to help, you just have to head over here and you can donate in less than three minutes! The St. Lawrence Run for Fun is a new race in the Bay Area, and was a fundraiser for the St. Lawrence Elementary and Middle School. 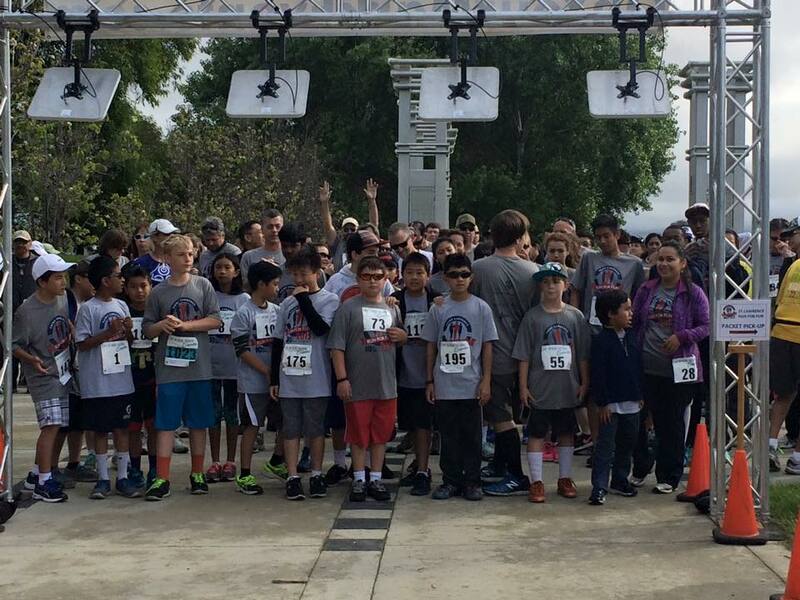 The turnout was typical of a small, new race — around 200 in the 5k race, and around 40 in the 10k, and the location was Baylands Park in Sunnyvale. On paper, it’s a nice location — grassy parklands, situated on the bay, with plenty of well-maintained gravel trails. In practice, it can get pretty windy, and there’s a ripe smell that drifts in either from the bay or the nearby landfill. On Saturday, it wasn’t windy, but the smell definitely cleared the sinuses at a couple of points. Still, I’m being fussy — really, it’s a wonderful place to spend your Saturday morning running at a local fundraiser. Selina’s in Australia, and so our eldest daughter Lucy and I took to the trails. 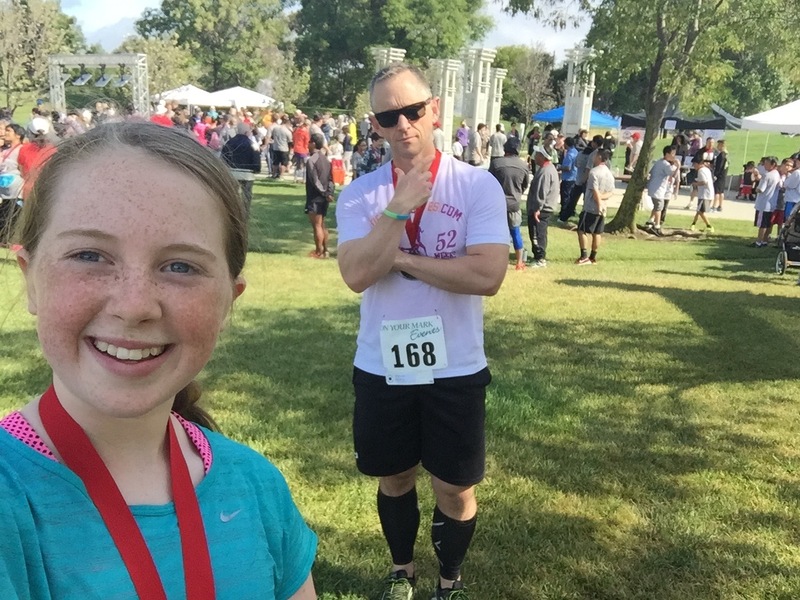 She ran a solid race, and placed first in her age group — a pretty awesome result and a cool medal to show for it! But how’s this: I actually *won* the race. There’s a first time for everything: I can assure you I’ve never won a race in my life, I’m not even sure I’ve ever been in the top three. Yep, 1st out of 200. There’s a back story. Like many inaugural races, there’s something that isn’t quite right. In this race, there were plenty of cones at the turnaround point (at almost exactly the 2.5km or 1.55 mile mark), but there wasn’t anyone standing there saying “this is the turnaround”. So, the three young guys about 30 seconds in front of me just kept on going. I yelled out to them (aren’t I kind? ), made the turn myself, and took off — and so I was in first place in a Steve Bradbury kind of way. All I had to do from there was not implode, and victory was mine. The track was wet, and the adrenaline was pumping, and so it was a pretty tough last mile. But, yes, I won the race — and I have a large crystal trophy and a $25 gift card to prove it. I’m pretty sure that’ll go down as one of the racing highlights of the 52 race challenge. Next up is the Great Race from Saratoga to Los Gatos in California. It’s Sunday. Wish me luck with that! What a crazy week! International travel wears you down. But it is truly amazing to fall off the plane and into a race — and trail running is good for the soul. Doubly so at the magnificent Mt Diablo. We ran the Brazen Racing Mt Diablo Trail Challenge on Sunday morning, and that’s race #15 in the books. We’re well on the way to 52 races in 52 weeks to raise awareness for the GBS/CIDP Foundation, and $52,000 to help people who suffer from Guillane-Barre Syndrome and related conditions. If you’d like to be part of helping, you can head over here and donate. Any normal week, we’d run the 10k or contemplate the half marathon. But with the trip to Australia and back this week, we made the smart choice and ran the 5k. It’s a great little run — out and back on a sandy trail, with three or four creek crossings, and a little bit of agile scrambling over smooth rocks. We were warned that our feet would get wet, and that was very true — the third creek had probably half a foot of water in it and was a few yards across. Navigating a creek at speed is a challenge, but it sure beats pounding asphalt on some city street somewhere. Ah, trail running! I ran into first place in my age group, and 8th overall. That’s more of a testament to the fact that the serious runners were in the 10k and the half-marathon. Selina, my speedy wife, came 2nd overall in the women’s division and also first in her age group. Not bad after an international flight, nothing to sniff at. If you haven’t run trails, and you enjoy running, give it a try. You’ll thank me. And, if you’re in NorCal, give Brazen Racing a serious look. They put on the best organized races around, in beautiful settings, and with amazing medals and shirts. The food is awesome too. Weekly update: Fifteen races run! We’ve now raised $25,134 for the GBS/CIDP Foundation. That’s only $25 this week, but it’s a very cool story. Read on. Weekly stats: 48% of the way to the $52k goal, and 29% of the way to the running goal. Getting the story out there about GBS and raising funds is truly energizing. I feel blessed to have recovered and to be able to turn a negative experience into a positive one — and all this is running is doing me only good! This has been one of those weeks where I’ve had a chance to talk to people close to me about why I’m doing this, and the positive feedback they’ve given me makes me feel great. Onward and upward! This week we had a donation of $25. Norman Herms of Philly mailed a check into the GBS-CIDP Foundation International with the following message: “Please give this check to Hugh Williams. I do not have a computer. I had GBS in 1988 at 55 years old. After 65 hospital days and ten days of therapy I recovered 100%”. What a great man he is for donating through the good old snail mail! Thanks Norman (if you know him, pass on my thanks!). 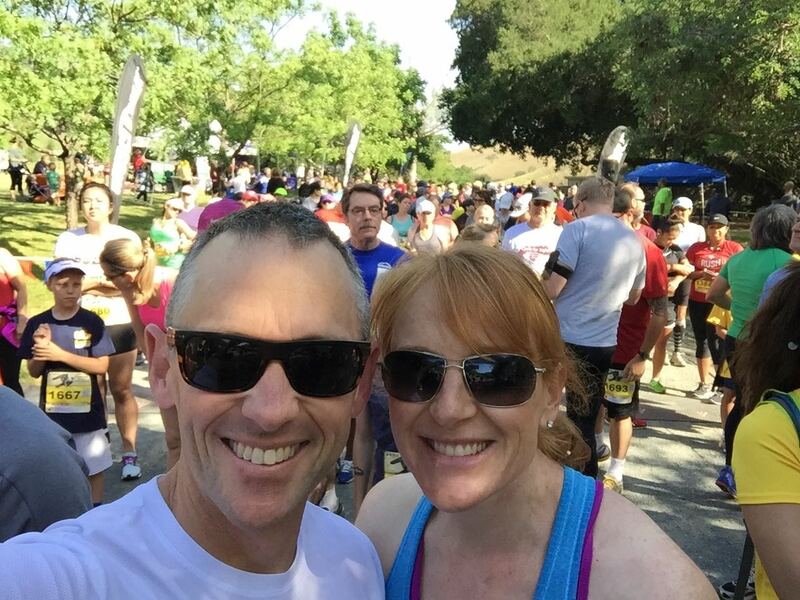 We ran one race this week, the Brazen Racing Mt Diablo Trails Challenge 5k. My race report is here. All up, a very amazing place to run, and trail racing remains my favorite kind of running. Next week, we’re planning two races. Can’t wait! Weekly update: we’ve raised over $25,000! We’ve now raised $25,109 for the GBS/CIDP Foundation. It’s just over two months since we started our fundraiser — thank you for helping us get very close to half way to our goal of $52,000! And we’re making progress on running to raise awareness too — we’re now over a quarter of the way to our goal of 52 races in 2015! Weekly stats: 48% of the way to the $52k goal, and 27% of the way to the running goal. It’s been a great one, I’m glad you asked! My friend and former colleague Paul Todd donated $200, Lynn Merel donated $35, and Kiera Lynch donated $100. Very cool people! Your donations mean a ton to me, and just as much to the GBS/CIDP Foundation — thank you to all 88 of you for being amazing! 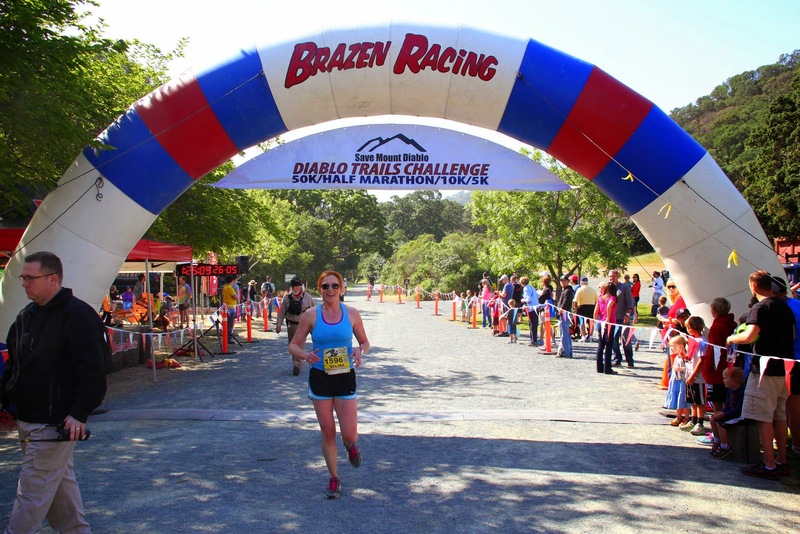 Next week, we’re planning to run the Brazen Racing Diablo Trails 5k up at Mt. Diablo. It’ll be fun to get back to some trail running, and special to be in the shadows of Mt. Diablo. I promise a few great photos! Our fundraising challenge continues. We’ve run 14 races in 2015 toward our goal of running 52 races to raise awareness of Guillane-Barre Syndrome, and we’ve raised almost $26,000 for the GBS/CIDP Foundation on our way to the goal of $52,000. Help us help people who suffer from GBS and related conditions by heading over here and donating. We were up at 5am on Sunday, out the door at 6am, and running the most beautiful race we’ve run this year at 8:30am! 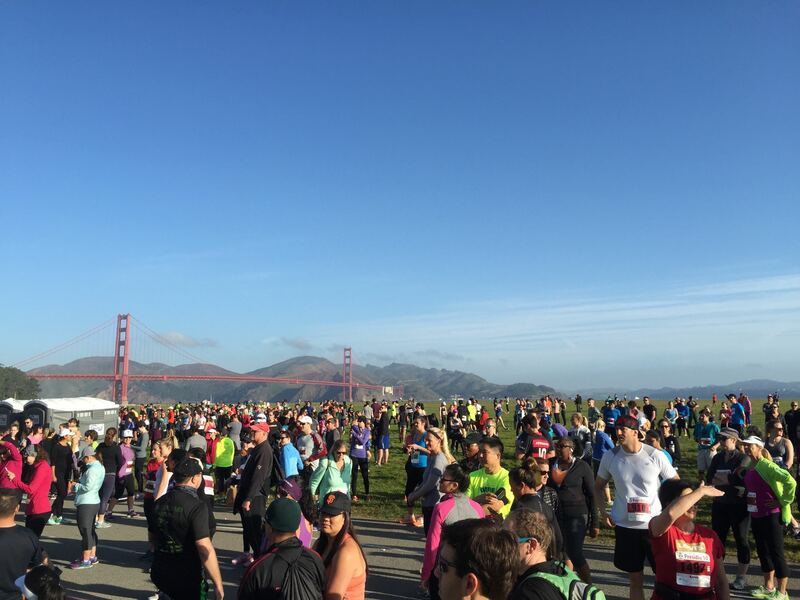 The Presidio 10k started on Crissy Field in San Francisco, almost in the shadows of the Golden Gate Bridge and near the infamous Alcatraz. The weather was beautiful, the views spectacular, and the race was overflowing with runners running either 10 miles, 10 kilometers, or 5 kilometers. We took the 10k challenge — after running yesterday, we didn’t want to run 10 miles, but we also wanted to run across the bridge (and the 5k route didn’t cross the bridge). The race was incredibly well organized, the vibe relaxed, and the crowd in the mood for a fun run on a Sunday morning.There must have been a few thousand people running, and that always makes the atmosphere special. 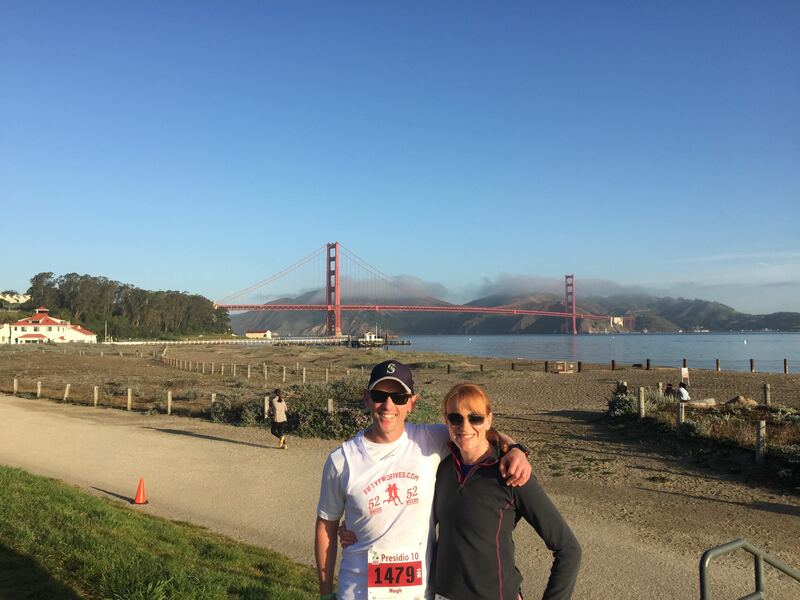 The route took us through the Presidio, across the bridge, back across the bridge, and along the foreshore of the bay, and across the finish line. I’m not sure there’s too many races that’d beat this one for scenery. 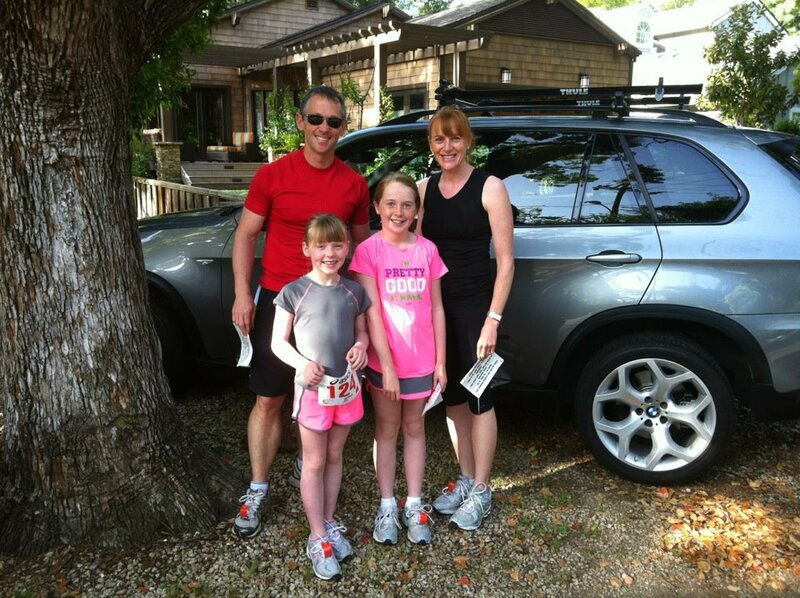 We loved the race — we have to run this next year — and Selina’s sure it was her favorite so far this year. I’m thinking that I agree — you can’t beat SF on a beautiful day, and running across the Golden Gate is a special treat. 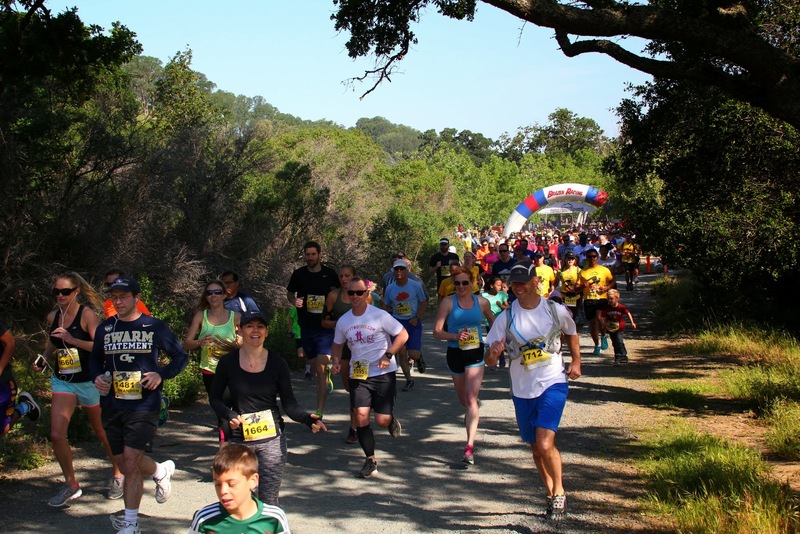 Next week, we’re headed to the Brazen Mt Diablo race, which should be special too. See you next time.